It has been a while since my last content as there has been a lot going on lately. Finally I got a breather and it is time again to do what I love doing which is sharing, places, culture and life in our country. Take a ride with me today as I take you to the province. 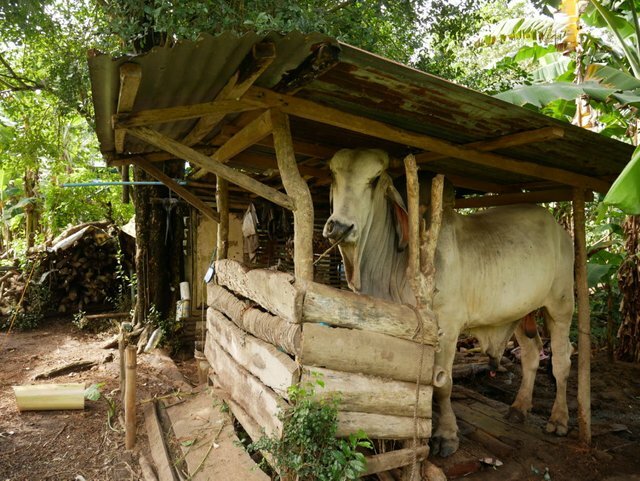 Here you will see the simple life and let me invite you for lunch in a traditional Philippine way. 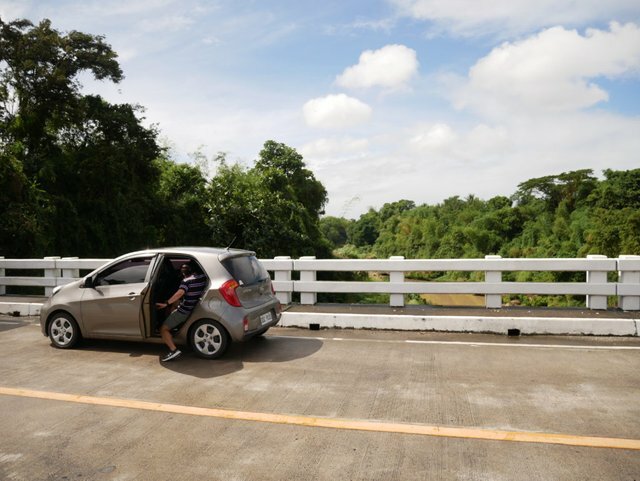 Fasten up, hop on as we go to Bailen, Alfonso Cavite in the Philippines. A two hour drive from our place we headed out to surprise a friend of the family. 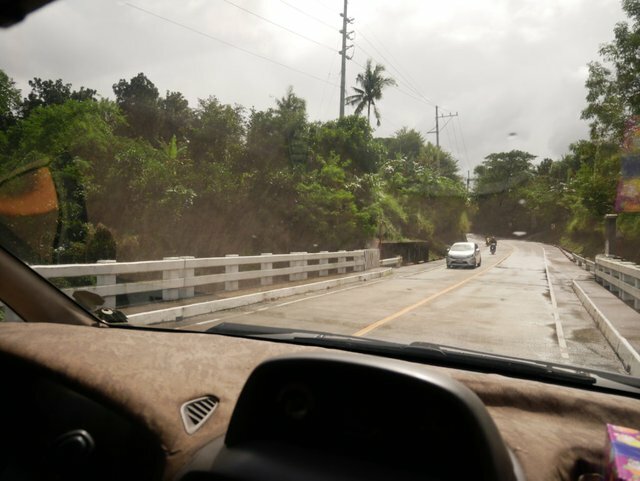 Driving to the province will always lead you to empty quiet roads. Driving in empty roads is stress free, no traffic lights, no traffic jams, less pollution and you could definitely open the windows to feel the fresh air. We passed a lot of bridges along the way. This one was too good not to pull over just to take a couple of shots. 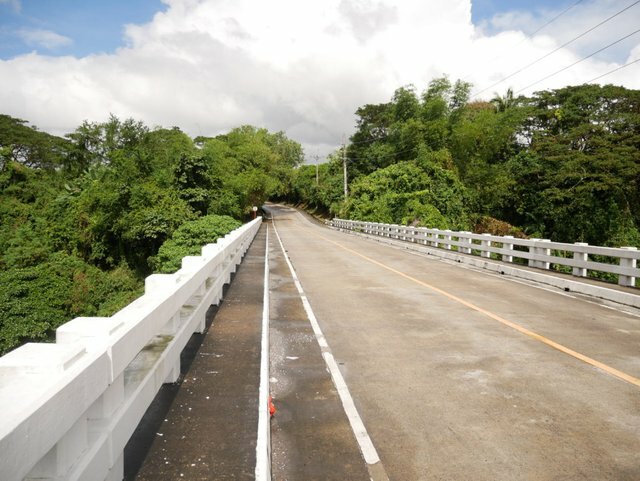 An empty bridge with no vehicles in sight. My brother in law also pulled over as soon as he saw parking at the side. 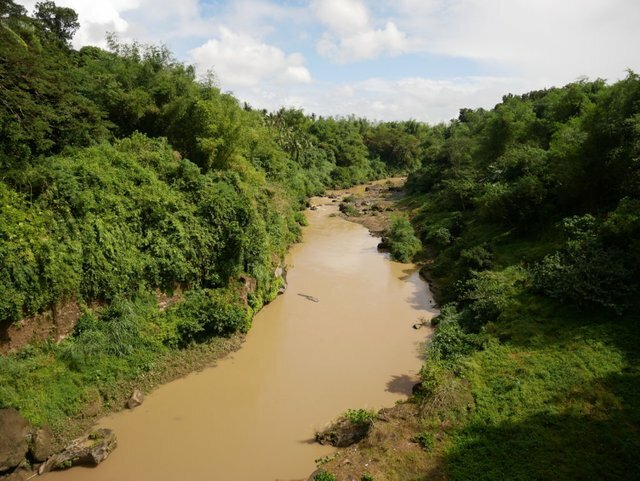 As I looked over the river is brownish in color. I would be enchanting if the water was crystal clear. I do not know what has caused the brown color, could be from the soil. I was told that people fish here and catfish are abundant in this river. 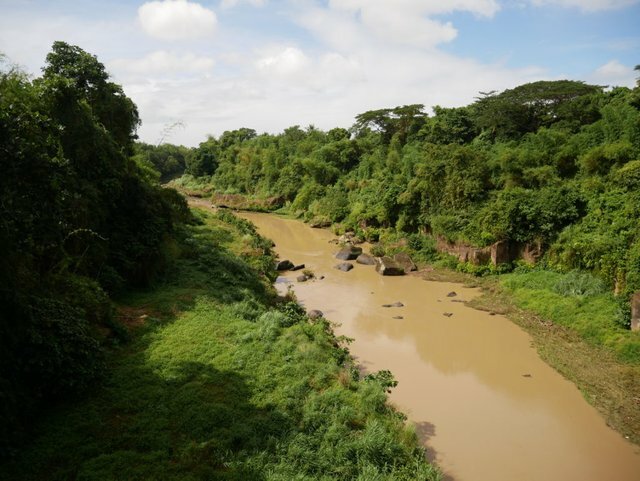 Would you eat fish caught from this river? 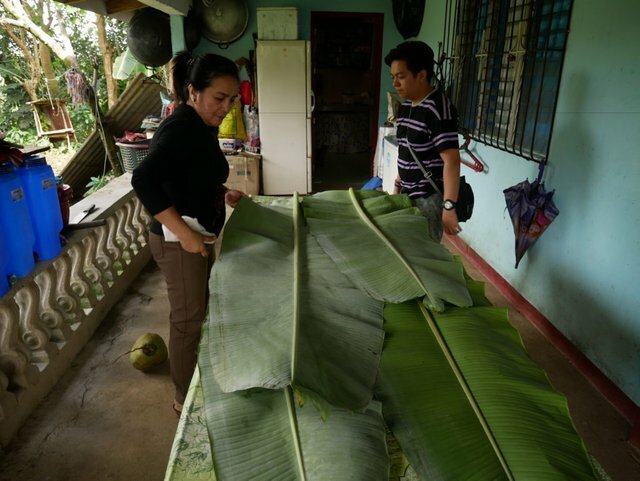 If it is safe and good to eat for the local, why not? 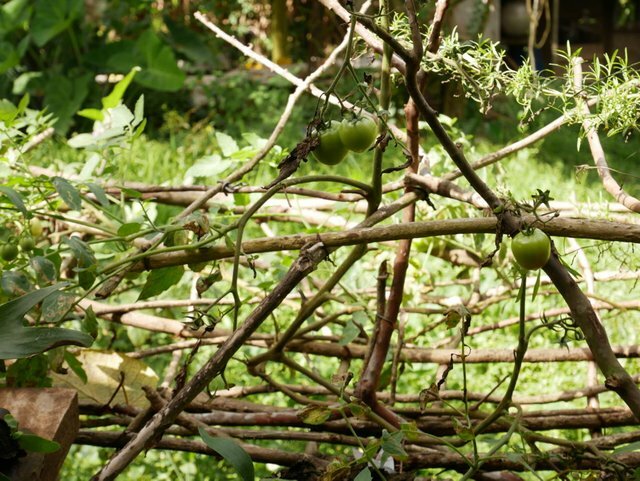 In some areas food is scarce and people adapt by eating what is available in the area. Off we went and continued with our journey. This is another bridge that we passed and I was told by my brother in law that it was not always like this. 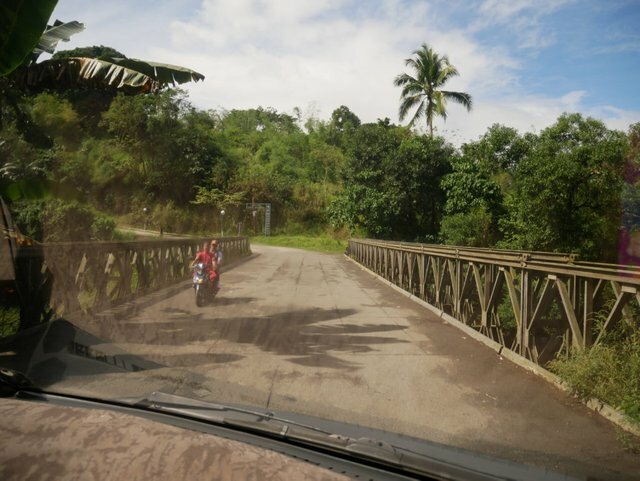 Before there were no cemented roads with only dirt roads and wooden bridges. After that long empty highway, I did not expect that we would be going deeper into the province. As we made that left turn to the inside road. I took a snap shot of the sign board and the guys captured in the photo gave me the eye thinking I was taking a photo of them. People in the province are friendly in nature, but you can never be to careful. 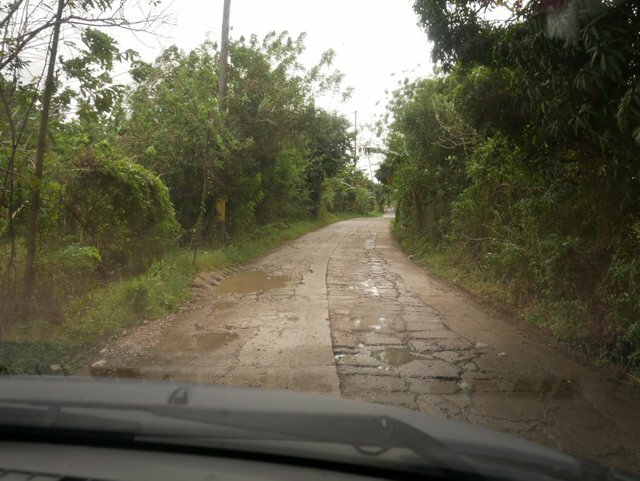 As we went deeper the roads were getting worse. It is a good thing that our van had big wheels and built for off road, so no issues with driving on pot holes and cracks. My brother in law said that we are almost there as soon as he saw this steel supported bridge. We finally reached our destination after that long drive. 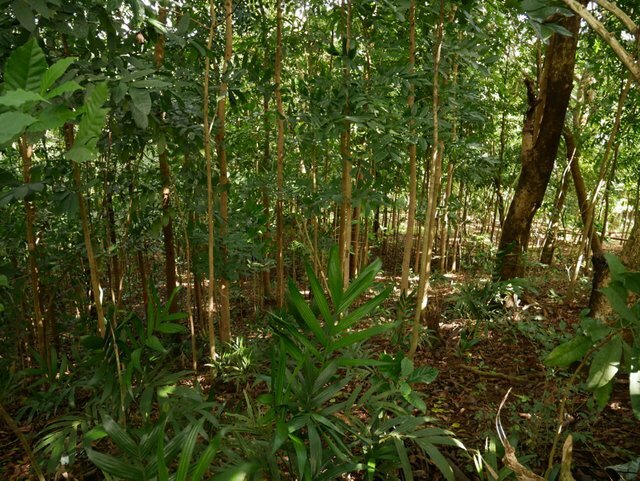 Here you could feel the environment which is very pleasant and different from the city. The air is cooler, fresher and the wind almost hums you to sleep. 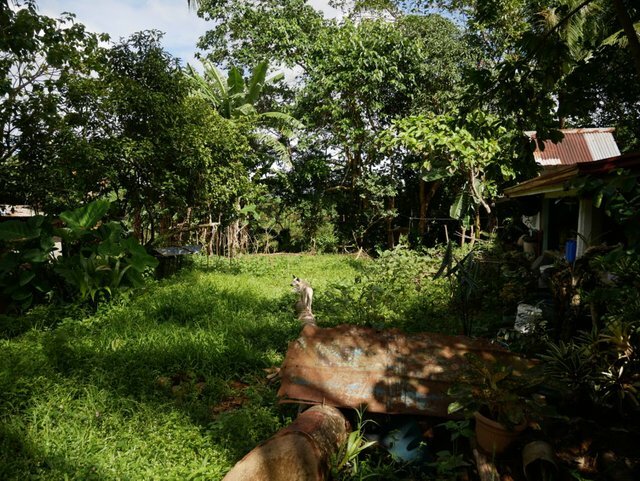 This is the typical farm life in the Philippines with plants, vegetables and a few livestock. The kids were so eager to explore the place and was attracted to cow in the small shed. A dog was barking, but was no threat. He just barked a couple of times and then retreated to the house. The cow that they had was really big and I see this type pulling large carts loaded with different goods. Travelling from town to town, this cow is very strong. 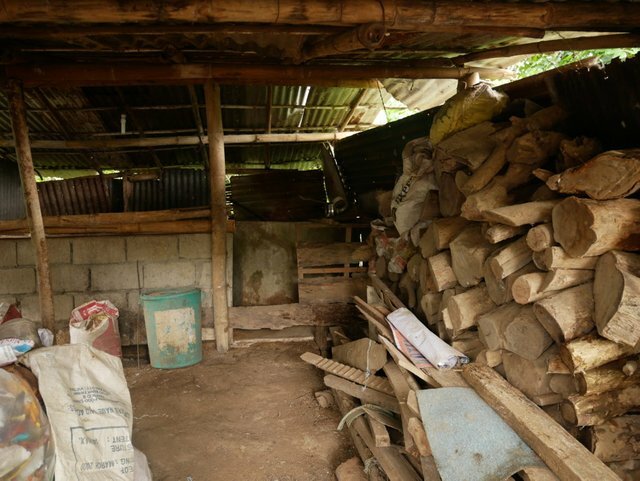 They had piles of wood in stock that they use for cooking. 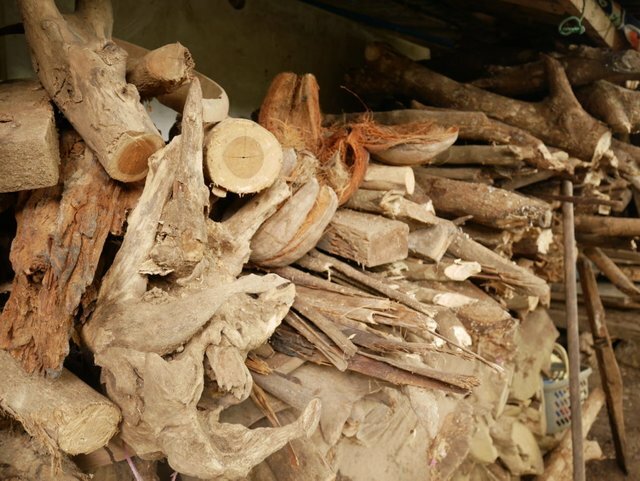 Dried pieces of wood, branches and even coconut husks. In this shed, I smelled something and immediately I knew they had pigs. A smell that is very distinct and easily recognizable due to the manure. 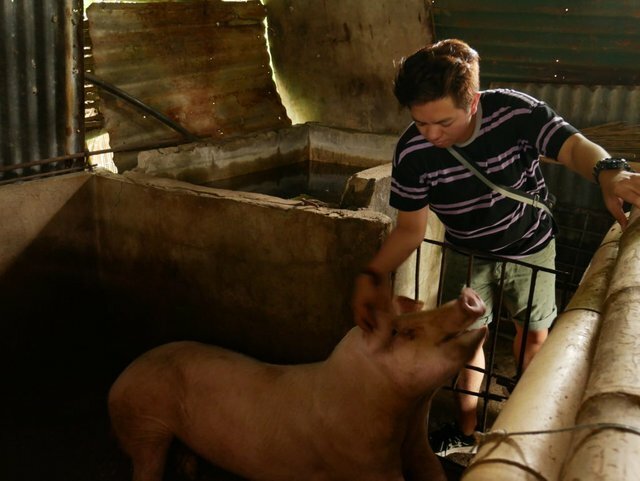 As expected they had a big pig, it is very common raising pigs here in the province as it is a good source of income. Some even raise domesticated wild boars and I saw some up in the mountain years ago. 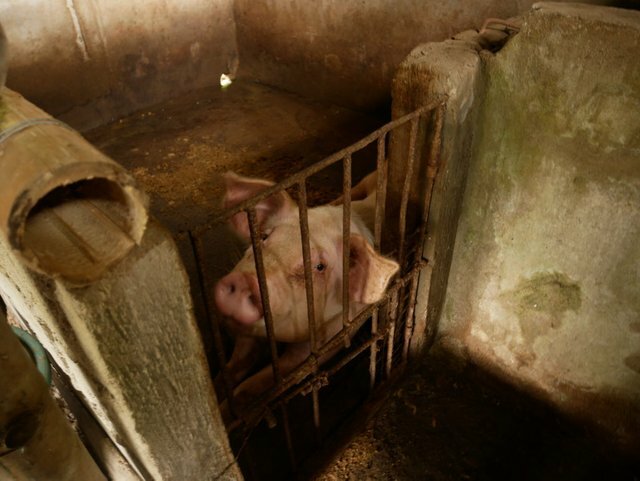 I saw a couple of wild boars raised in pens, I have heard that boar meat is much tastier that the local pigs. Here is my brother in law petting the pig. 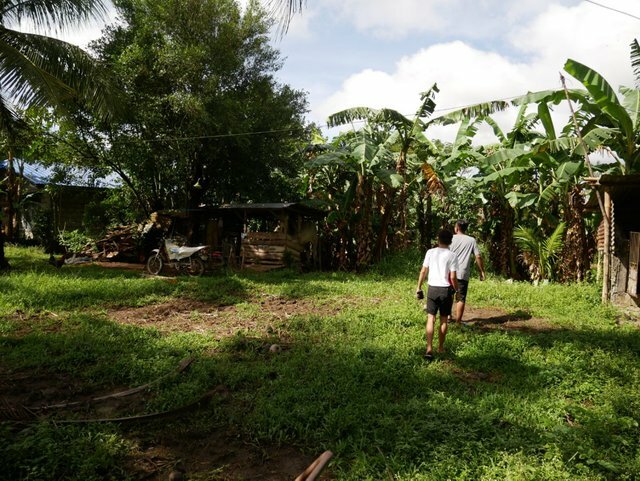 He even invested in raising two pigs last year in this farm. A business venture which is very profitable if you know what you are doing. I went outside to see what trees and plants they have. I saw this tree with a lot of strange fruit and I do not know what it is or if it is edible. The back part of the house had a lot of trees which leads to a river at the bottom. We were advised not to go there this time as the ground is very muddy and slippery because of the rain earlier this morning. 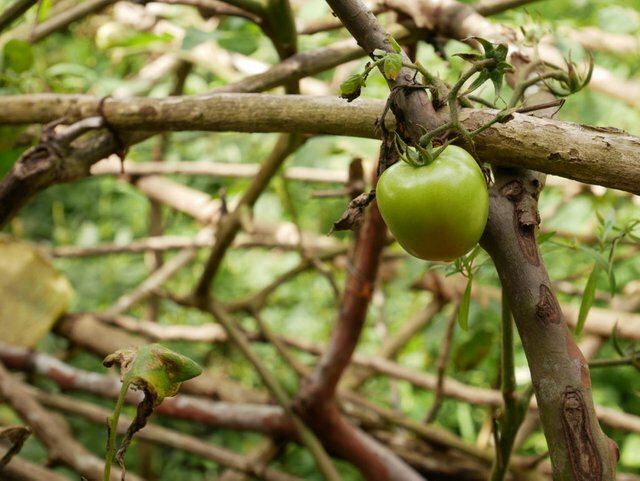 They had fresh tomatoes in their garden which is just within reach. 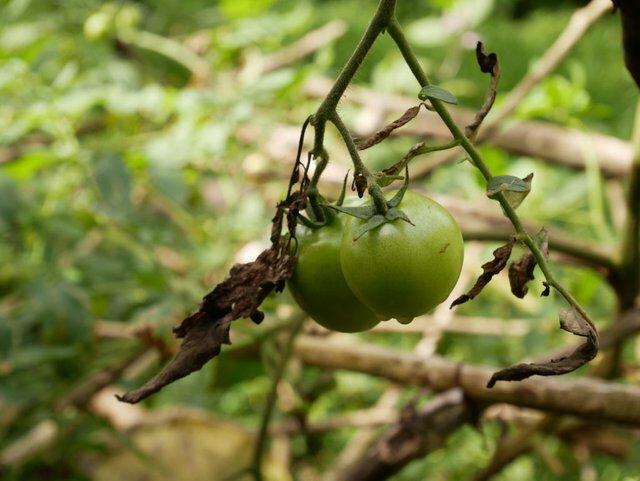 I tried planting tomatoes in pots, but they always die no matter how hard I try to take care of them. Here they are thriving and the plant looks very healthy. Maybe it is because of the rich soil and the cool weather. It is time to prepare lunch, but before that let me tell you about this traditional way of eating. 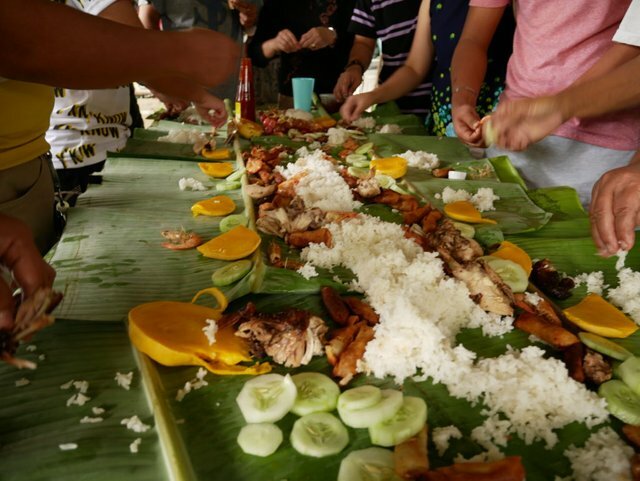 Popularly called as Boodle Fight it has been adapted from the military. 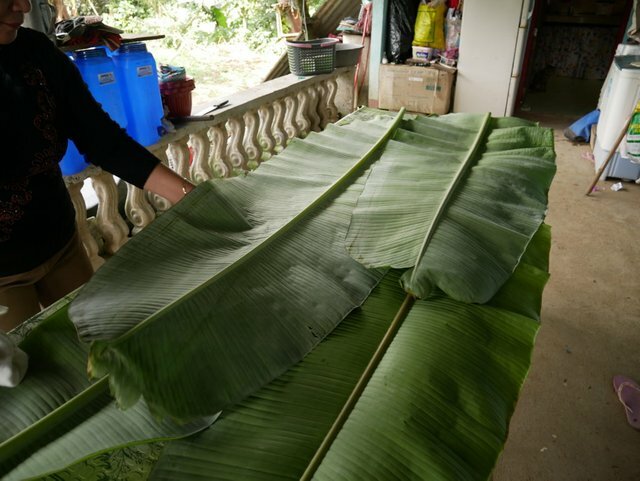 During training banana leaves are laid on a long table and filled with mixed food of different sorts. Rice are topped with anything that is available like sardines, vegetables and meat dishes. During training the soldiers rush as pass by the table and grab whatever they could and eat as fast as they can. This promotes camaraderie to our soldiers. It has been adapted and has become a very popular way of serving food this time without the rush. 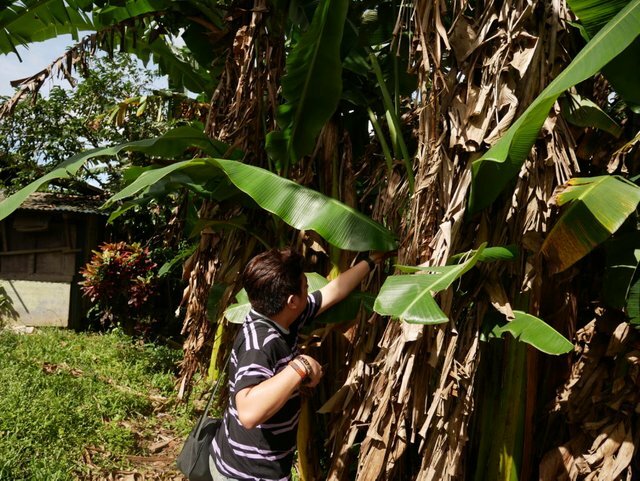 We were asked to get the leaves from the nearest banana tree. I told my brother in law to select the freshest ones preferably the new leaves. I told him that I got him covered by taking photos of him while cutting the leaves. He felt that it was not fair, but I just told him that he looked good on the photos. My mother in law was in charge of preparing and cleaning the leaves. Normally, we use the top part of the leaves, but she said that it is the bottom part that should be used. The proper way of preparing is to wipe the leaves with a clean cloth and then letting it pass over a fire for a few seconds. Now it is time to prepare the food and we had some left overs that we could add. It is best to put newly cooked steaming hot rice in the center. On our way here we bought some roasted chicken and we also had left over shrimp, lumpiang shanghai (spring rolls), cucumbers and mangoes. 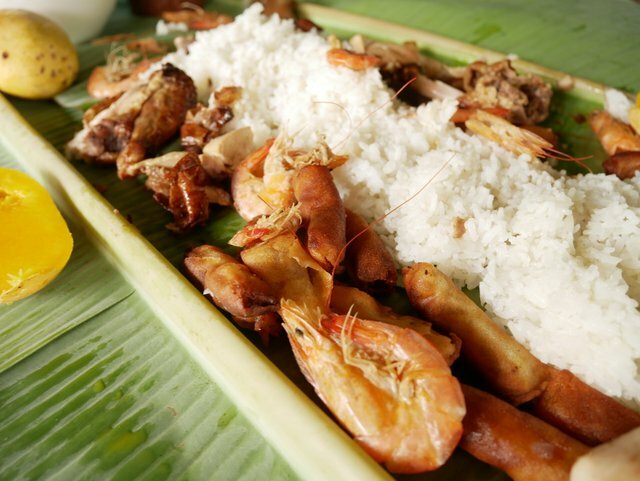 Any dish would be perfect in a Boodle fight, but an all seafood meal is the best. A balance portion meat is placed in sections for each individual. If you eat a lot it is best to sit next to someone who does not eat much. You'll be ending up eating your seat mate's portions. 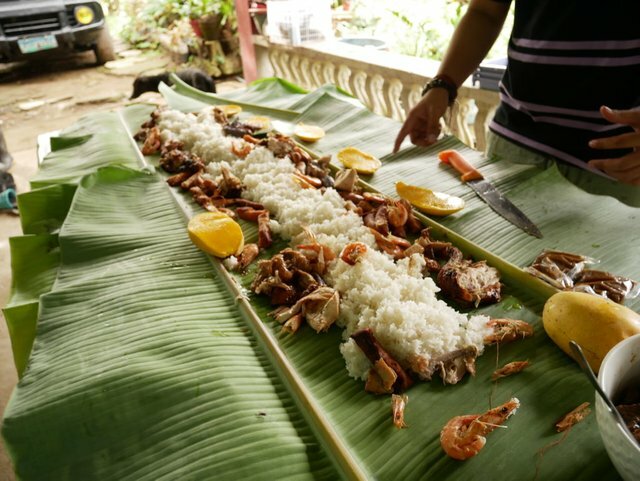 Boodle Fight is ideal when eating outdoors, preferably near the ocean or in this case in the province. Although, we have done this at the office it is still best doing it outdoors. The food is ready and it is time to call everyone to the table for this delicious family feast. Here is the family getting ready for the fight and if you noticed there are no utensils. The traditional way of eating is with your hand, but be sure everyone washes their hands first. I cannot explain, but eating with your hands in this setup somehow makes food taste much better. In a fancy restaurant is a different story, but out here in a Boodle Fight there is no other way to do this. It maybe a meal with leftovers, but the bonding is genuine as you could see smiles on faces. A meal like this with the family is priceless which like the military it promotes bonding. No worries in making a mess and you could even politely ask to pass over some chicken if your area is running low. Cleaning up after eating as we know is a pain, but in this case just roll the leaves and throw them away. No more washing of plates and drying them off. I hope you enjoyed the lunch and thank you for joining us today. 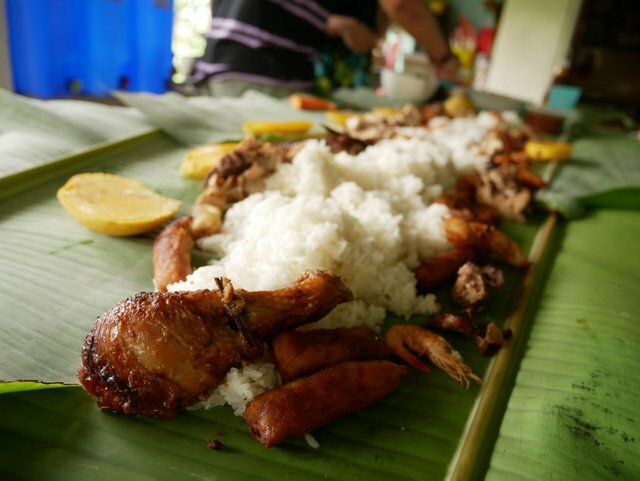 How would you like to try the Boodle Fight? If you are down to earth and looking for a unique dining experience. I strongly suggest that you give this a try. A fun way to eat with friends and family. 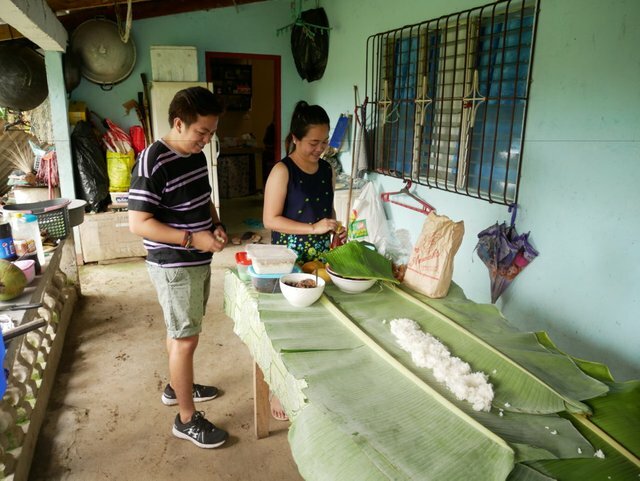 Experience a Philippine tradition and do not be afraid to experiment to try new things. Let me know what you think as I would love to hear from you. See you next time and enjoy the rest of your weekend. The Boodle fight is very interesting. For someone who loves their food it would probably cause me some pre meal stress about who is getting what. I love the idea of the team bonding though and your family look like they are having a great time. Hey Gaz how are you? 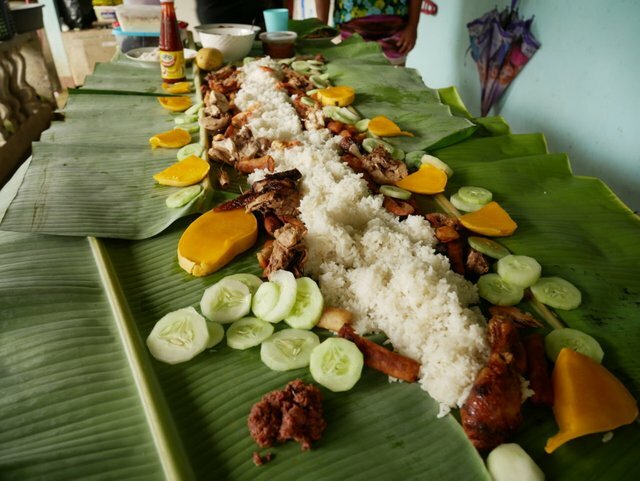 You should see the ultimate Boodle Fight. We had one a few years ago with the family. The banana leaf is loaded with all the good stuff grilled pork and chicken, mussels, oysters, shrimp, crab, grilled squid, steamed vegetables with salted duck eggs. Something for everyone. It was intense and pretty hard to decide where to start. I am imagining if the #powerhousecreatives family lived all close by and we had this amazing feast. That would be awesome. That looks like an amazing way to share a meal together! We definitely need to set up some kind of #powerhousecreatives meet & greet and have a boodle fight of our own! I will dream about that day when we could all get together. It would be so surreal meeting the PHC family in person. 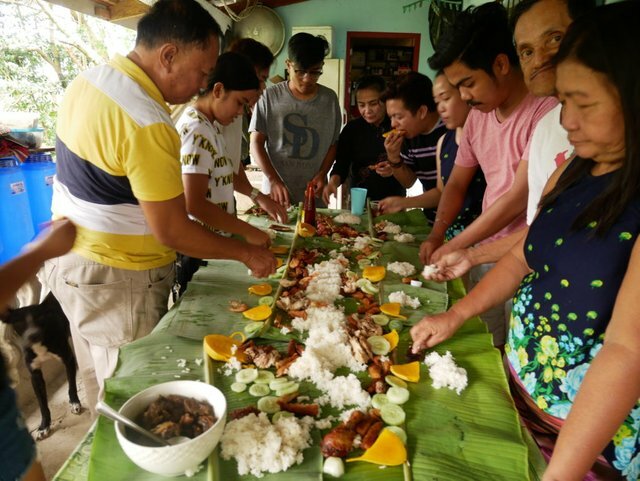 I guess for now those living near each other will have a chance to have a go with the boodle fight. A great way to build a stronger bond is sharing a meal together. Wow, what a great idea with the banana leaves. We will be sure to try it out sometime soon! 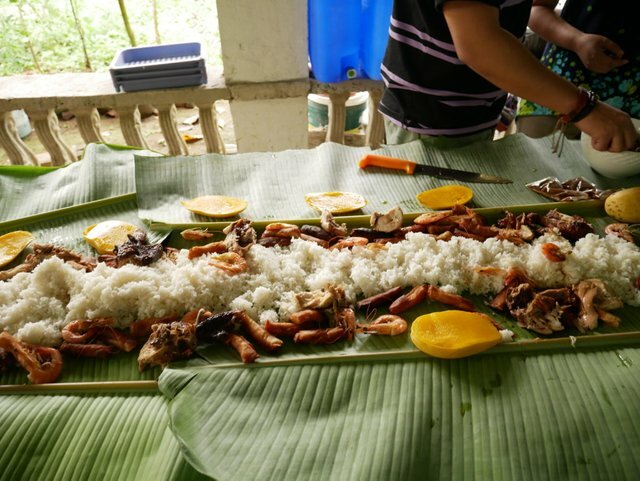 Be adventurous and try it one of these days in a Boodle Fight anything goes. Throw in anything, roasted, stew, steamed no restrictions. A no holds barred feast hahaha. Blessing to you aswell my friend. Thank you very much for dropping by. I appreciate it. I do love that last bridge, @watersnake101 - good to have you back! I so love that way of eating. Interesting that you eat standing up - no chairs? In South Africa, in some cultures, eating with your hands is also traditional espcially for a braai. That is such a good idea for presenting a large quantity of food when serving platters are short. If you eat a lot it is best to sit next to someone who does not eat much. You'll be ending up eating your seat mate's portions. Hahahah it is my strategy all the time during Boodle Fights lol. Although there are some rare occasions that it does not work. I recall at the office we had an event and food was served this way. I chose to sit beside a girl office mate who was small and slim. I was so wrong as I didn't know she had an appetite like a hungry soldier lol. The seats in this occasion no one wanted to bring out chairs lol. Oh good to know. I always thought that bull was only referred to the bull fighting in madrid and the bull riding rodeo lol. Thanks. I would like to thank you for this post, this had bring back great memories for me @watersnake101. 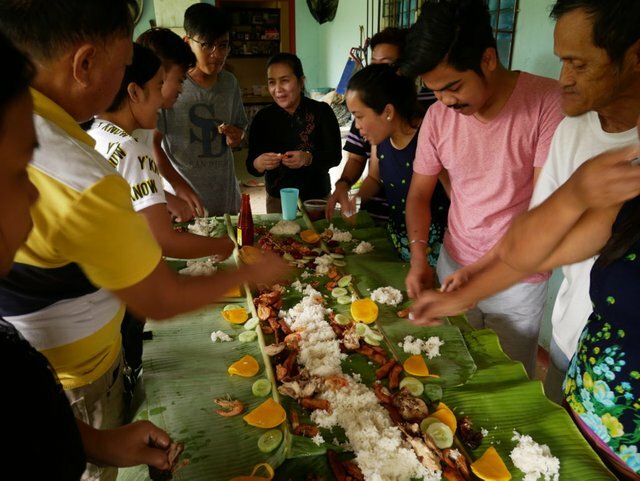 I meet a lot of Filipinos when I was working at Brunei few years back and became very good friend, eating together like this was one of my best experiences when with them, such a joy! 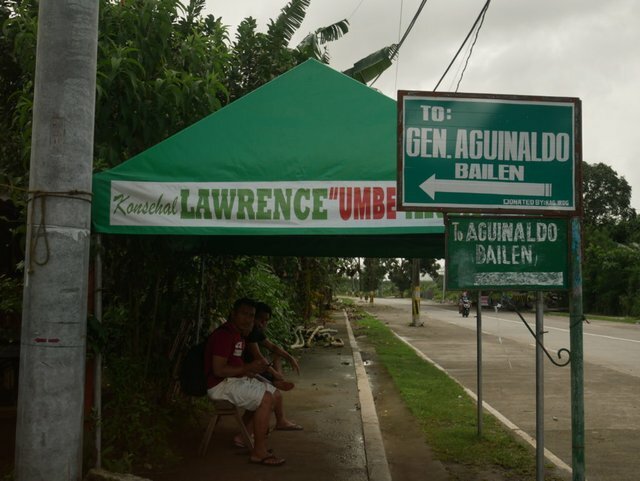 P/s I was smiling when I saw Lawrence because one of my best friend is name Lawrence! You are very welcome. It brings a smile to my face knowing you have experienced this way of eating. I am glad it was a great experience for you. I had to go back in my photos to look for Lawrence lol. Konsehal Lawrence and konsehal is councilor in english. Say hi to Lawrence for me if you get a chance to chat. Cheers! Great Post my friend. The food looks delicious. I wish I could have been with you. Hey hey! Would be great if we all lived close by, you would always be welcome in our family feasts my friend. 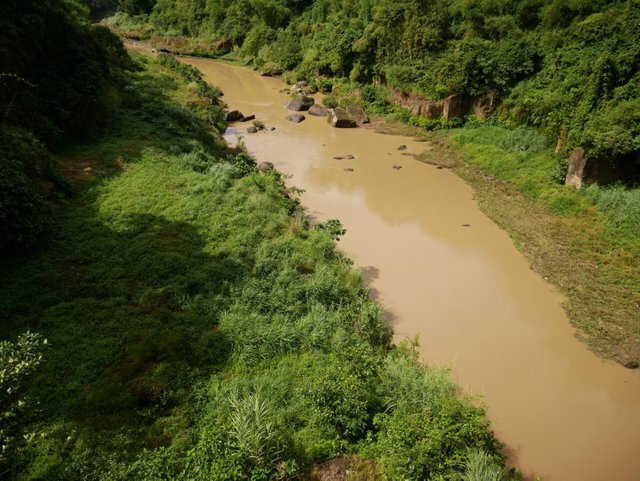 The river does look brown but I think could really be the soil. Maybe it's the constant movement of the lives (fishes and all) in there that cause the soil to constantly mix with the water. By the way, the food party looks great too. Wow! I just love adventures, especially with family. So glad you were able to make this journey and I appreciate the photos. I love seeing how other people live. That pig is just too cute! I am glad you liked it. I love capturing life as it happens around me no matter how simple it is. They actually own two pigs in the farm, the other shed is near the big cow. Thank you very much for dropping by. Thank you very much and I would love to see the similar tradition that you have there. Please do share with us if ever you get a chance. Fingers came first, I agree wash your hands and enjoy the meal @watersnake101 interesting to see you use banana leaves for eating off of. I know they are used to cook food inside when over a fire, very traditional way of cooking, quite popular here in our area as well in Durban. Will have to practice the art of saving dishes, great tip! Oh you should try it at least one. 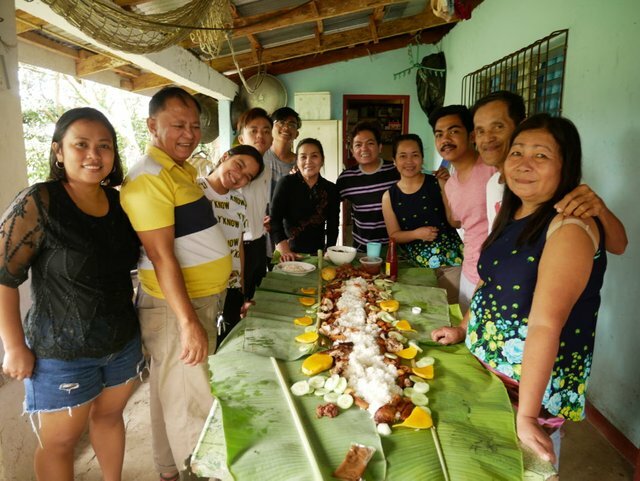 Having a feast with the family on a banana leaf is quite an experience. Just throw in any dish within the mix. The combination that I love the most is grilled fish, shrimps, crab and shell fish. Throw in some sliced tomatoes and grilled eggplants. I tell you it will make you want to eat more. Seafood mix sounds like a wonderful way to share off banana leaf platter, I definitely will try this one day. Wonderful, the food looks really delicious and mouth watering. Any snakes there? Haha thank you. About the snakes I am not really sure if there are any around the area. I guess I was the only snake there at the time lol. 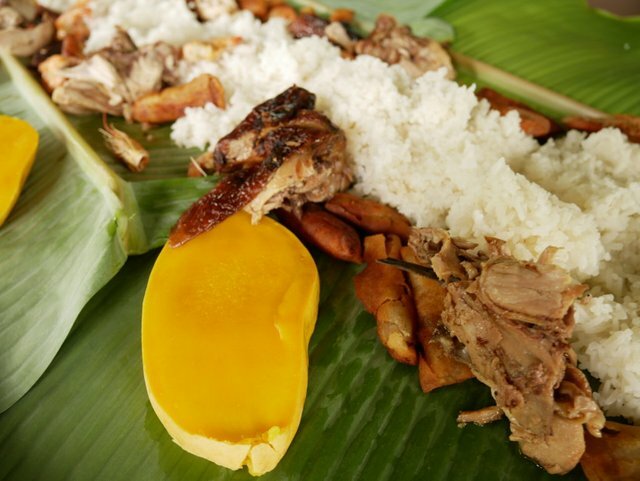 I have to admit when I first saw the phrase Boodle Fight, I was intrigued!! I am happy that you took interest in one of our popular traditions. I really appreciate it. I have never been to India but a lot of your content gives us a nice window to your country. Thank you. Ahhh...thanks @watersnake101 indeed it is a place to explore many things....hope to see you around some day. I love this! How in-depth, I think your readers had almost as great a time on your journey as you did! You comment means a lot, it has been a while since I got a chance to post again. Thank you very much for the kind comment. You are very welcome! It's wonderful seeing you! There are very beautiful palm trees! And about the food ... I have never eaten like this, on the leaves, it looks very unusual. Oh you will be in for a treat especially with fresh seafood in the mix. 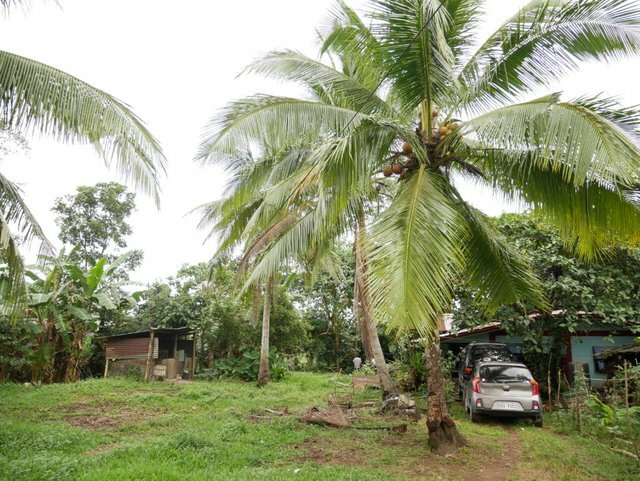 You love the coconut palm trees, they can be found everywhere here. 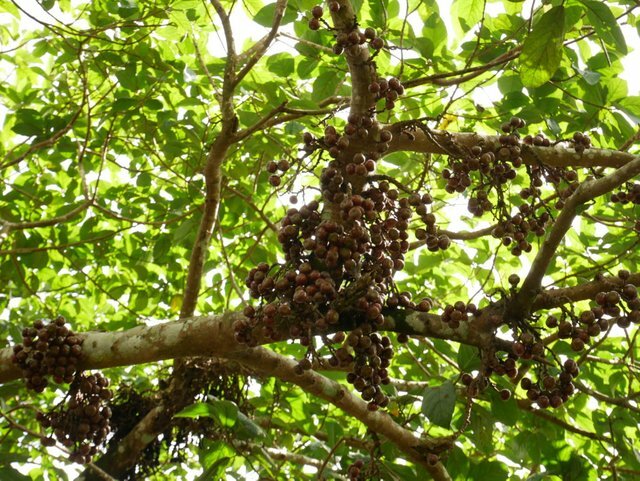 It is a very useful tree cool sweet coconut water, delicious meat, lumber can be used as cheap construction material, the leaves used as roofing material and broom making. If ever you get a chance to visit our country. I'm sure you would have so much inspiration for your artwork. Great posting @watersnake101. The cow looked a little big for it's stall. I love the setup and it looks delicious. Hey glad you liked it. I think he just hangs around there when it is hot, he often roams around the place according to them. The rope is a bit long to give him a lot of space to more around. A definite must that hands should be washed thoroughly. I have been seeing a lot of restaurants lately promoting the boodle fights. Still the best is home prepared with family and friends. Thanks kabayan. No worries. We have to be proud of our heritage! Such a interesting & undoubtedly tasty tradition! Are You live on Phillipines? Yes I live in the Philippines. I appreciate your interest in our country. I often share a lot of our places, culture and life here. This entire post is beautiful! From seeing the wonderful world of where you live, the plants, the animals, the home to everyone gathering around for a meal. This is what real living is. Beautiful, thank you for sharing! I should be thanking you for your very kind words. Life is beautiful and we must enjoy every moment of it. I am glad I was able to share a slice of life from our country. My heart over joys knowing people take interest in what I share. Thank you. This looks like a fun tradition. I wonder if there are any places in the US that serve it. I don't ever see Filipino restaurants though, so I'm thinking they are quite rare. I think there are a few states with a Filipino community. Most of the Filipino restaurants are in that area. I am not sure if they serve Boodle Fight. 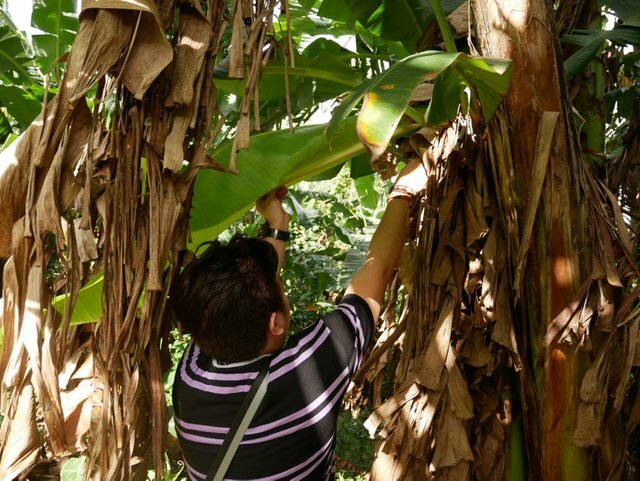 If you could find some banana leaves, explore something new. You could give it a try with your family and friends. With no dishes to wash lol. No dishes to wash sounds pretty fantastic. The trick would be finding the banana leaves. I've never seen them for sale even in specialty stores here. Lol! I hear ya lol. Always sit beside the skinny person who looks like they don't eat much lol. Glad to share my friend, I think it is about time for you to bring out the banana leaf and call in some family and friends. Wonderful! Now i am REALLY sick of winter and want to come visit. Let swap places as I would love to see winter lol. I think winter would be a good thing to travel to so that you could just get a taste, then turn it off and go home.